It’s the latest “Buzz-word” in orthopedics. But what does it mean to the average Joe? If you are over 50 years old and a female, it means a fragility fracture could happen to you. In fact, you have a 50/50 chance of sustaining a fragility fracture after the age of 50. Our male counterparts are at risk as well. One out of every three men over 50 are at risk of sustaining a fragility fracture. A fragility fracture is defined as any broken bone caused by a fall from a standing height or less. In some cases, fragility fractures can be present without evidence of trauma. People with osteoporosis and low bone mass are at significantly increased risk of suffering a fragility fracture. Fragility fractures are commonly seen in the wrist, ankle, hip, spine, and proximal humerus and are treated with splints, casts, braces, or surgery. Many studies have shown that the greatest risk factor for sustaining a fragility fracture is history of a previous fracture. However, studies also show that 4 out of 5 patients will receive no further treatment or evaluation of bone health past the initial treatment for their broken bone. If appropriate treatment and interventions are initiated soon after the first fragility fracture occurs, the risk of future fractures can be significantly reduced. So what else should be done? A patient diagnosed with a fragility fracture should have a full evaluation for their overall bone health. This should include a bone density study and testing to rule out underlying medical conditions that can lead to low bone mass. It should also include education of the patient and family regarding good nutrition, dietary supplementation of calcium and Vitamin D, fall risk prevention, a safe exercise program, and pharmacological management of osteoporosis. Initiating this type of work up after a fragility fracture has been diagnosed will dramatically reduce the incidence and severity of subsequent fractures. It’s never too late to have your bone health evaluated. Whether a fragility fracture happened last week or last year, getting an evaluation of your bone health is warranted. This can be initiated by your healthcare provider or your orthopedic specialist and should absolutely be done to help prevent future fractures. Incorporate good eating habits. Foods rich in calcium and protein help overall bone health. Your goal calcium intake should be between 1200-1500mg daily and is best obtained through your diet. Get your Vitamin D. Vitamin D is difficult to get through your food so an over-the-counter supplement is often needed. A good place to start is 1000IU daily and may be increased by your healthcare provider should your Vitamin D level be low. Watch your step! Avoid slippery surfaces or footwear. Install grab bars and a shower chair in the bathroom. Take your time when up and about. Remove throw rugs and clear any clutter around the house. Utilize night lights in the bedroom, bathroom, and hallways at night. Avoid bending or twisting activities. Avoid lifting more than 10-15lbs and when you do have to lift – use the legs not the back! Stay active! Safe activities for people with osteoporosis include Tia chi, walking, stair climbing, biking, hiking, and strength training under the guidance of a professional. The Comprehensive Bone Health Clinic at NH NeuroSpine Institute is the first of its kind in the state of New Hampshire. We utilize our multi-specialty team to treat patients with fractures and to provide the knowledge and treatment towards prevention of future fractures. In some cases we take charge in the overall management of osteoporosis or in some cases refer the patient back to their primary care provider if they prefer. NHNSI offers patients the leading care in overall bone health while providing cost effective treatment solutions with the convenience of onsite services. Currently, there is an estimated 44 million people living in the United States with either low bone mass or osteoporosis. Studies estimate that by 2020 over half the population of the United States with be effected by this disease. Fragility fractures have become nearly epidemic in the United States among older adults with over 2 million fractures each year - more than heart attacks, strokes, and breast cancer combined. Preventing just one fracture can save patients thousands of dollars in healthcare. NHNSI is working with ImPACT in an effort to ensure a safe recovery for athletes whom have suffered from a concussion. ImPACT is a 20 minute neurocognitive test that has been scientifically validated to measure the effects of a sports related concussion. 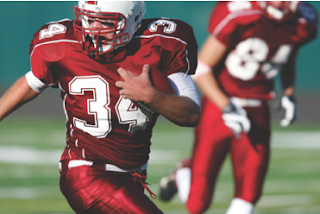 As fall athletes begin their season, it is important to us that they take the proper precautions prior to playing an impact sport. Baseline ImPACT testing is extremely important in the post treatment of a concussion. NHNSI has made it easy to receive this baseline testing and concussion management without having to coordinate a concussion management team for your athletic department, team or school. We will coordinate the testing for your team with individual testing times or small group testing slots. The team is given the baseline testing for a flat rate and we will continue to follow the team in the event a concussion does occur and post injury testing and management is necessary. Individual enrollment is also available. Call our ImPACT coordinator today at (603) 637-2300. The importance of a Comprehensive Bone Health Clinic is that all the providers are treating the patient with a common goal: to avoid future fractures. 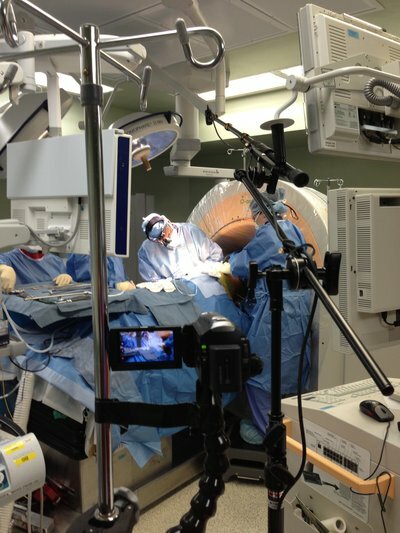 The New Hampshire NeuroSpine Institute is unique in our approach to spinal compression fractures as we have a team of experts to work together in addressing our patients’ problems. A spinal fracture occurs when one of the bones in the spinal column breaks. This type of fracture is also known as a vertebral compression fracture because the bone that breaks (the vertebral body) often cracks and collapses, becoming compressed. When patients come to us with back pain stemming from a vertebral compression fracture our team of professionals will look at the underlying cause of the problem through our Comprehensive Bone Health Clinic, utilize therapies such as PT and Bracing in cooperation with our Physical Therapists, or schedule the patient for surgery. In recent years, the treatment of spinal compression fractures has advanced considerably with the development of the surgical procedure known as Balloon Kyphoplasty. 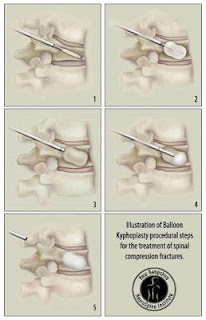 With Balloon Kyphoplasty, an orthopedic balloon is used to elevate the bone fragments of the fractured vertebra and return them to the correct position. The incision site is approximately 1 cm in length. A hollow instrument is used to guide the balloon into the vertebra. The balloon is then inflated so that the collapsed vertebra is returned to its normal position. Once the vertebra is in the correct position, the balloon is deflated, leaving a space for bone cement. The cement stabilizes the fracture and holds the vertebra in place. The Kyphoplasty is minimally invasive. It is typically done in an outpatient setting at a hospital or surgery center. As with any procedure, there are potential risks and the procedure is not for everyone. If you are suffering from back pain and have a history of fractures or bone loss you may be suffering from a compression fracture. It’s important to find the right course of treatment for you. Call New Hampshire NeuroSpine Institute to find out more about our Comprehensive Bone Health Clinic at (603) 472-8888.